NAVITEL® has been awarded with "Success of the Year 2018" statuette in Best Product category. 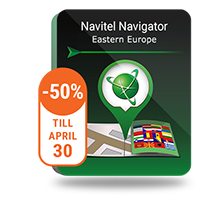 NAVITEL® has been awarded with "Good Brand – Quality, Trust, Prestige" sign in Navigation Systems category. NAVITEL® company rewarded with two statuettes: IT Champion - for Producer of The Motorization Sector and for The Best Producer Service. according to International Development Fund "Eurasia"